This wonderful event is being held for Ann Wilson to raise a WHOLE lot of money to fund a Stem Cell re-boot to halt the progression of her MS in Moscow in October. 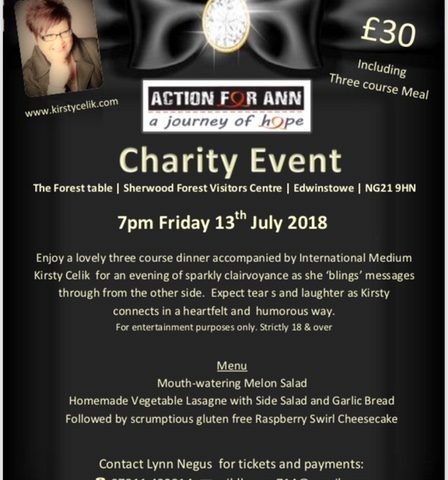 So on the 13th July at the Forest Table Restaurant in Sherwood Forest Visitor Centre, I am hosting an evening with Kirsty Celik, clairvoyant. It will be a 3 course homemade meal, a chat from Ann Wilson (of which this event is supporting) and 1.5 hours of Kirsty working the room and doing her magic. It will be £30 per person. We are hoping to have a silent auction or tombola as well as Kirsty Celik will raffle off a free 121 reading. There is a full bar in the restaurant, ample parking and a chance to have a great night with friends whilst giving our support for Ann. I will post in here more info on Ann’s plight as well as some info on Kirsty Celik. Looking at starting the festivities at 7pm.